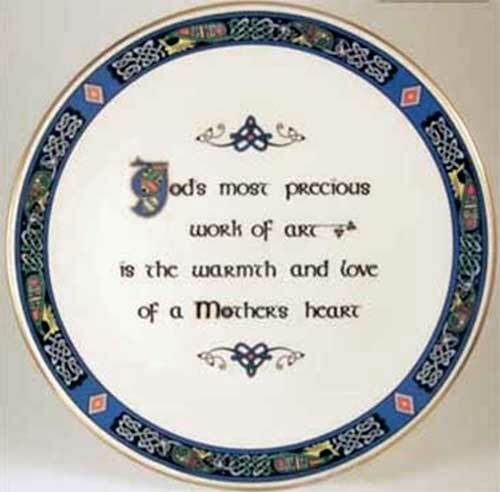 The Irish mother's blessing plate has the following sentiment: Gods most precious work of art is the warmth and love of a mothers heart. This fine bone china plate features an Irish blessing for mother and it is enhanced with Celtic knot illustrations that are inspired from ancient Irish manuscripts. The mother's blessing plate measures 8 3/4" in diameter and is made in Galway, Ireland by Royal Tara China. The Irish mother's blessing plate is gift boxed with a Celtic knot history card that is complements of The Irish Gift House.